Agonda beach is a small, striking and sheltered beach. An ideal place for the honeymoon holidays in Goa. Who seeks serenity by resting in the lap of mother nature. The beach is 3km long and is rather isolated due to its remoteness from the main cities. 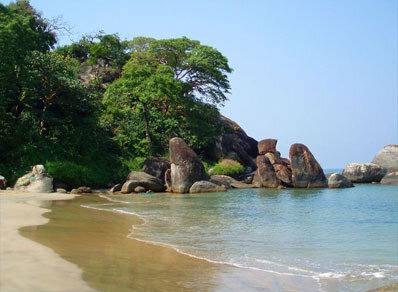 Agonda beach is an idyllic retreat for those who want to spend time in solitude and insolence. Spreading over three kilometers of golden sand dotted with palm trees, this lonely beach with its serene beauty is an ideal gateway for those who want to immerse themselves in tranquility. One can experience the beauty of solitude enhanced by a heavenly silence and broken by the roaring sea waves. Most easiest way to visit this lonely beach is, by private yacht or speed boat. To discover your adventurous streak at the Agonda beach, you can get a tent onlease and set a night camsite under the glittery skies and gushing waves.